Apple Pay is Apple's new mobile payments service, which it first debuted in September alongside the iPhone 6, the iPhone 6 Plus, and the Apple Watch. Apple Pay is expected to become widely available to consumers beginning in October, and ahead of its official release, we've gathered everything that's currently known about the service into a roundup so users can get an idea of what to expect. With Apple Pay, iPhone 6 and 6 Plus owners will be able to make payments for goods and services with their iPhones, both in stores and within participating apps, using the NFC chip built into the devices. While Apple Pay will initially be restricted to iPhone 6 and 6 Plus owners, iPhone 5, 5c, and 5s users will also be able to take advantage of the service if they purchase an Apple Watch after it is released. Apple has described Apple Pay as the most secure payment solution available, as it uses Device Account Numbers rather than storing credit card numbers and keeps all payment information in a dedicated chip on the iPhone, called the Secure Element. All payments are verified using Touch ID, which prevents someone who has stolen a device to make unauthorized purchases. Furthermore, if an iPhone 6 or 6 Plus is stolen, its ability to make payments can be disabled through Find My iPhone. 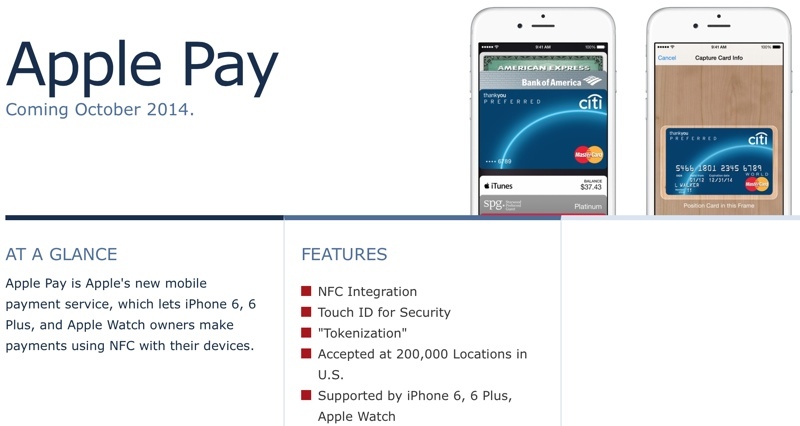 Apple has said that Apple Pay will be available beginning in October, enabled through an upcoming update to iOS 8. I know this stuff is the future but getting people like my parents into it will be tough. Especially when my dad won't get a smart phone. I know, what you are talking about. Since I got the iPhone 6, I gave my mom my old iPhone 5 and she appreciated it but really doesn't know how to use it. She wants to go back to her flip phone. I predict Apple Pay will fail within 2 years. They are trying to merchant problems by changing consumer behavior, and they only have access to a tiny slice of the payment market. It might take them a few years, but I think it could be the future. Maybe one day Android will do the same and we all will be paying with our smartphones and watches. Hell, Apple has changed us using smartphones and tablets in the last few years. I look forward to using Apple Pay.. Hope some of the local merchants do it. Android has had NFC payments for several years now. Smartphones are overkill for payments. All that is needed is a secure identification. There are cheaper, simpler ways to provide that. Maybe Apple will find some way to popularize this, but I haven't seen anything in their current offerings that look promising. I've been using the Isis wallet now soft card for a while now. It works quite well. I know Android has NFC chips, but I don't see anyone tapping their phones next to those express pay things. If Android has that capability? I agree smartphones are an overkill and it lillitery one way to hold all of our personal information onto one device, until somebody loses it and all of their personal information is out there. But unfortunately some humans are now getting lazy and don't want to carry bulky wallets and now this is where this new technology comes in. It does. I use it a lot. I have my Amex linked to it and it works like a charm. Ditto, I look forward trying it out as well and probably people will ask me how did I pay for that? I'll be one of those wait and see if it takes off people. I'll always carry a wallet for ID and cash anyway. A couple of credit cards doesn't change the weight or bulk noticeably. This is what it what it looks like on my phone. Nice, but it not showing your numbers, by chance what is it after 37?